The leader of the Liberation Tigers of Tamil Eelam (LTTE), V Pirapaharan, in his annual Heroes’ Day statement put a heavy responsibility on the shoulders of the international community for the breakdown of the peace process. He said that the involvement of the international community to resolve the Tamil national question has been unhelpful and added that their failure to condemn unambiguously the military path of the current regime has created the present situation in the island. He asserted that the propping up of the genocidal Sinhala State by the international community through economic aid, military aid and subtle diplomatic efforts will be counterproductive. About the long and bitter history of deception by the Sinhala State he further said, "None of the Southern parties are ready to accept the core principles for a lasting peace: the Tamil homeland, the Tamil nation and the Tamil Right to self determination. The ruling party is adamant on unitary rule; the red and yellow parties are calling for no solution at all; and the main opposition party, somersaulting from its earlier position, is, on the one hand, saying nothing concrete and using evasive language to support the military actions of the government and, on the other hand, saying it supports peace efforts. All this clearly clarifies our point and proves beyond doubt that all the Sinhala political parties are essentially chauvinistic and anti-Tamil. To expect a political solution from any of these Southern parties is political naivety." Drawing the attention of the international community to this long history of deception by the chauvinistic Sinhala State, the Tamil national leader said that the confidence of the Tamil people on the international community has been eroded by their one-sided approach. He pointed out that nations like East Timor and Montenegro broke free of their subjugation and gained their freedom with the help and support of the international community. He added that the actions of the international community with respect to the Tamil national question are unjust and said that Tamil people hoped that the international community would change their biased approach and recognize the sovereignty of the Tamil nation. The LTTE leader called on the global Tamil community to support the Tamil Eelam freedom struggle. "I wish to express my love and gratitude to you for your past participation in the building of our nation, bringing together your abundant intellectual, material, monetary and many other resources in the service of our nation and ask that you stand with us in the coming years of our freedom struggle," he said. The 21st century began as the ‘Asian century’ and the world is looking towards Asia. Many countries in our region have grown in leaps and bounds in social, economical and scientific fields. They are researching space, moon and atom. The whole human race is taking up new challenges and has embarked on a united path, seeking answers to many of nature’s mysteries and looking for remedies to incurable diseases. It is seeking to protect the entire globe and its plant and animal lives. Sadly, the Sinhala nation is moving in exactly the opposite direction, on a path of destruction. It is trying to destroy the Tamil nation and, in the process, it is destroying itself. This beautiful island continues to soak in blood. Buddhism is a profound spiritual duty. Its philosophy emphasizes a life without desires, a life of love and justice. The Sinhala nation, claiming that it has followed this path for more than two thousand years, has in fact remained immersed in the poison of racism. It is unleashing unthinkable violence against another people. During the long history of the Tamil struggle, first through non-violence and later through armed struggle, the Sinhala mindset has remained unchanged. The Sinhala nation did not change even after so much destruction and lost lives. It continues on the path of violence. It only desires to find a solution to the Tamil question through military might and oppression. It cunningly evaded efforts to seek peace and is boldly taking forward its military plan. The international community’s economic and military aid, its moral and political support, its diplomatic efforts, and its one-sided involvement directly aided this turn of events. We know very well that the military, economic and geo-political interests of the world’s powers are embedded in our region. We understand their concern to take forward their interests. We also recognize the concerns of the international community to bring about stability and good governance to this island for these reasons. At the same time the chauvinistic Sinhala State is attempting to exploit this interest in our region of the international powers. It is trapping the international community in its chauvinistic project and turning the international community against the Tamil freedom struggle. Our people are dismayed and disappointed that these countries, trapped in the deceptive net of the Sinhala State, are being unhelpful in their involvement to resolve our problem. These one-sided involvements of foreign powers are not new in our prolonged struggle. India intervened in our national question then as part of its regional expansion. India signed an accord with the Sinhala State without the consent of the Tamils. The Indo-Lanka Accord was not signed to meet the aspirations of the people of Tamil Eelam. In fact, India then attempted to force an ineffectual solution on our people - a solution which did not even devolve powers to the extent of the Banda-Chelva pact signed in the 1950’s. India tried to enforce that accord with the strength of more than 100,000 Indian forces, with the power of the agreement between two countries and with the assistance of treacherous Tamil paramilitary groups. However, even this ill-considered solution, which did not even address the basic national aspirations of the Tamils, was blocked by the chauvinistic Sinhala State. We are intimately familiar with the Sinhala State and its deceptive politics. Our people have a long history of bitter experiences. That is why we explained to India on many occasions, at many locations and at many levels about the implacability of Sinhala chauvinism. We explained to India then that the aim of the Sinhala State was not to find a solution to the Tamil question and bring peace; but to occupy the Tamil homeland, destroy its resources, and enslave the Tamil nation. India refused to accept this reality. As a result our land witnessed great sorrow and destruction. Today, the international community is making the same mistake that India made many years ago. Even the countries that are the guardians of the peace efforts succumbed to the deception of the Sinhala State and listed our freedom movement as a terrorist organization. What we find most incomprehensible is the fact that these same nations, which labeled us terrorists, not so long ago fought in defence of their own freedom. The Sinhala nation is unable to stomach the support of our Diaspora for the Tamil freedom struggle; it is unable to accept the humanitarian help and the political lobbying by the Diaspora to end the misery heaped on our people. That is why the Sinhala nation is trying hard to shatter the bond between our people in our homeland and our Diaspora. Some countries are also assisting this amoral effort of Sinhala chauvinism. These countries are denouncing, as illegal activities, the humanitarian actions and political protests of our people abroad – actions that are carried out according to the laws of those countries. These countries have imprisoned and humiliated Tamil campaigners and representatives. These countries have ridiculed their protests and their efforts to seek justice. This partisan and unjust conduct of the international community has severely undermined the confidence our people had in them. And it has paved the way for the breakdown of the ceasefire and the peace efforts. Furthermore, the generous military and economic aid they have given to the Sinhala State and their diplomatic efforts to prop up the chauvinistic Sinhala State has encouraged the Sinhala nation further and further along its militaristic path. This is the background to the confidence of the Rajapake regime in continuing with its unjust, inhuman war of occupation of our land. Overconfident of its military victory over the Tamil freedom movement, the Rajapakse regime has shut fast the door for peace. The desire to oppress the Tamils has intensified as never before. With the entire world giving support, the Sinhala State, using the ceasefire as cover, and exploiting the peace environment, prepared its war of occupation. The SLMM that was monitoring the peace covered its eyes, tied its hands behind back, and went to sleep in Colombo. The exhausted Norwegian facilitators remained silent. The countries that preached peace to us also went silent and refused to speak out. The Sinhala State started its war and justified it with slogans like ‘War for Peace’, ‘War against terrorism’ and ‘War for the liberation of the Tamils’. The Rajapakse regime assembled its military might and let loose a massive war on the eastern region of our homeland. This part of our homeland became a wasteland after incessant bombing and shelling. Trincomalee, the famous Tamil capital, was destroyed. Batticaloa, an ancient cultural city of the Tamils, became a land of refugees. Jaffna, the cultural centre of the Tamils, was cut off from the rest of the world and turned into an open prison. The Sinhala State’s war of genocide destroyed the peaceful life of the Tamils. It turned the Tamils into refugees in their own homeland, ruined their nation’s social and economical infrastructure and plunged them into unprecedented hardships. While our motherland, caught within gruesome Sinhala military rule, is destroyed, Sinhalisation of our historic territory is going on under the pretexts of High Security Zones and Free Trade Zones. This naked Sinhalisation proceeds by the hoisting of Lion flags, the erection of Sidharthan statues, the renaming of Tamil streets with Sinhala names, the building of Buddhist temples. Sinhala settlements are mushrooming in the Tamil homeland. The unjust war, the economic blockade, the restrictions on our people’s freedom of movement, the killing of thousands, the displacement of hundreds of thousands, have all deeply wounded the Tamil psyche. The Sinhala nation is celebrating this tragedy as a victory. It is lighting firecrackers believing it has defeated the Tamils. 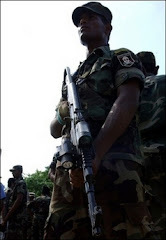 The Sinhala military leadership believes that its occupation of the east has been completed and the barbed wire noose around the neck of Jaffna has been tightened. The Sinhala nation arrogantly believes it has manacled the eastern coast from Pothuvil to Pulmoddai. The Sinhala leadership thus believes it has won great victories against our struggle. The Sinhala nation has always misunderstood our freedom struggle. It consistently underestimates us. Only after carefully scrutinising the global situation and external conditions; only after accurately estimating the strengths and weaknesses of the adversary; only after gauging the enemy’s goals and strategies; only after ensuring that we remain focused on our own strategy; only then did we implement our plans to take our liberation struggle forward. We have strategically withdrawn from the east while launching defensive attacks. The Sinhala nation could have learnt the dangers of putting its feet too wide apart in our land as it did during past battles. But the Sinhala military has fallen yet again into the net we spread and it is now forced to commit large numbers of troops to rule land without people. Caught in a territorial trap, it will soon be forced to face the serious consequences of its misguided ambitions. Operation ‘Ellalan’, the very first combined Black Tiger and Tamil Eelam Air Force attack was a massive blow to the Sinhala military. It has disrupted the daydreams of the Sinhala nation. The Sinhala nation has not emerged from this massive shock delivered by our beloved fighters. The immeasurable dedication and sacrifice of our Heroes is delivering a message to the Sinhala nation. Those who plan to destroy the Tamil nation will in the end be forced to face their own destruction. The Rajapakse regime is never going to realize that the Tamil national question cannot be resolved by military oppression. The Sinhala leadership is not going to shed its desire for military supremacy or the Sinhalisation of the Tamil homeland. The Rajapakse regime is working hard to import more and more destructive weapons from all over the world without care for the cost. Therefore, it is not going to give up its war of genocide. The All Party Representative Committee was appointed by the Rajapakse regime to spread a smokescreen over the misery that its military adventures are creating in the Tamil homeland and to deceive other governments to get their aid and support. We clearly predicted this would happen one year ago. We have been proved right. After dragging on without putting forward any solution, the committee has gone on holiday. The past sixty years have proven beyond any doubt that no political party in the South has the political honesty or firmness in policy to find a just solution to the Tamil national question. It has been also proved beyond any doubt that none of the Southern parties are ready to accept the core principles for a lasting peace: the Tamil homeland, the Tamil nation and the Tamil Right to self determination. The ruling party is adamant on unitary rule; the red and yellow parties are calling for no solution at all; and the main opposition party, somersaulting from its earlier position, is, on the one hand, saying nothing concrete and using evasive language to support the military actions of the government and, on the other hand, saying it supports peace efforts. All this clearly clarifies our point and proves beyond doubt that all the Sinhala political parties are essentially chauvinistic and anti-Tamil. To expect a political solution from any of these southern parties is political naivety. The Sinhala nation showed eagerness in the peace talks only when we shattered their ‘Operation Fireball’ military action and made them realize that the Tigers cannot be defeated. It was only when we proved our military prowess and only when we were militarily in a position of strength that the Sinhala nation signed the ceasefire agreement. Now, with abundant monetary and military aid from several countries, it has rehabilitated its destroyed military and has prepared itself for war again. It is yet again walking the military path having abandoned the peace path. The Rajapakse regime, after unilaterally abrogating the ceasefire agreement, is ruthlessly implementing its military plan to remove the contiguity of the Tamil homeland. It has killed and disappeared thousands of our people. It reprimands and controls the Norwegian facilitators. It vehemently criticizes the SLMM. It even dares to brand senior UN officials as terrorists in order to hide its own terrorism. It is obscuring the ground reality in the Tamil homeland by striking fear among journalists and NGO workers. The world’s powers, even while taking forward their own geo-political interests, respect human rights and democratic institutions. Be it this universe, human affairs or international relationships, they all revolve on the wheel of justice. That is why nations like East Timor and Montenegro broke free of their subjugation and gained their freedom with the help and support of the international community. Even now, the international community continues to work for the freedom of nations like Kosovo. Yet the actions of the international community with respect to our own national question are unjust. The confidence our people placed in the international community has been eroded. By only paying lip-service to peace the international community has contributed to the killing of an extraordinary son of our nation, Tamilselvan. It has stopped the heartbeat of a light that walked the path of peace. I will be lighting the lamp for my dear brother, Tamilselvan, who until last year was with me every time we, with a burning desire to reach our goal, lit the lamps for our fallen Heroes. The international community has made the entire Tamil world drown in its tears. Had the international community firmly and unambiguously condemned the anti-peace activities and the war mongering of the Sinhala regime, Tamilselvan would be alive today. A huge blow would not have fallen on peace efforts. The Co-chairs, acting as the guardians of the peace process, have failed in their responsibility. If the Co-chairs do not have a moral obligation to protect peace efforts, what exactly is the purpose of their meeting from time to time in different places? Is it their intent to assist the Sinhala regime to wipe out the Tamils? Questions like these have arisen in the minds of our people. Our people firmly expect that at least from now on the international community will take a new approach in relation to our freedom struggle. On this sacred day it is the hope of our people that the international community will cease giving military and economic aid to the Sinhala regime and accept the right to self determination and the sovereignty of the Tamil nation. We are an ancient people with special qualities. We have a unique national identity and national foundation. We have been struggling non-violently and by armed struggle for a very long time against national oppression. We are not terrorists, committing blind acts of violence impelled by racist or religious fanaticism. Our struggle has a concrete, legitimate, political objective. We are struggling only to regain our sovereignty in our own historical land where we have lived for centuries, the sovereignty which we lost to colonial occupiers. We are struggling only to reestablish that sovereignty and rebuild our nation. The Sinhala nation is continuing to reject our just and civilized demands for freedom. Instead, it has declared a genocidal war on our land and our people. Behind the smokescreen of fighting terrorism, it is creating immense human misery. Despite our people enduring injustice and oppression, facing death, destruction and massive displacement, no country, no nation, no international organization has raised its voice on our behalf. We face this situation alone because, although 80 million Tamils live all around the globe, the Tamils do not have a country of their own. On this day, when we remember our Heroes, I ask the entire Tamil speaking world to rise up for the liberation of Tamil Eelam. I wish to express my love and gratitude to you for your past participation in the building of our nation, bringing together your abundant intellectual, material, monetary and many other resources in the service of our nation and ask that you stand with us in the coming years of our freedom struggle. Thousands of our fighters are standing ready to fight with determination for our just goal of freedom and we will overcome the hurdles before us and liberate our motherland. On this day when we remember our Heroes who sacrificed themselves for this sacred goal, let each one of us carry their dream in our hearts and struggle until it is achieved.